Factoid #91. At a time when Richmond had many “cordwainers”, “boot makers” or “shoemakers”, Thomas Miller stood out from the others and was known as a fine craftsman. According to a local legend, while still living in his native Ireland Thomas had made a pair of white satin slippers for royalty. Miller recounted to villagers that he had to wear white gloves to ensure that no blemish marked the surface. Factoid #92. George Seymour Lyon, a Richmond native, is famous for winning an Olympic gold medal for golf in 1904. Much has been written about his achievement in a wide range of sports, including cricket, and his relationship to the Lyon family. His grandfather, George Lyon, appears to have groomed his many sons for different professions or to assume control of different aspects of the family’s commercial enterprises. Robinson E., his son, and father of George Seymour controlled a large area of the estate’s agricultural land and lived just north of the fair grounds along the Huntley Road. George Seymour grew up on the farm and attended Richmond Grammar School. Factoid #93. The Richmond Military Settlement had a large number of Roman Catholics among its early settlers. In 1819 the Rev. Alexander MacDonell became the first clergymen to visit the village. He was a highly respected priest from Glengary and later became the first Roman Catholic Bishop of Upper Canada. Factoid #94. 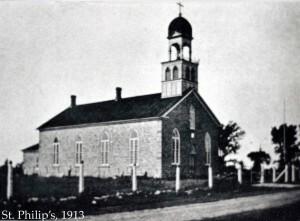 After the burning of the log St. Philip’s church in 1857, the congregation quickly rallied to construct a stone replacement, which forms the base of the present building. The earliest picture I’ve seen is the 1913 photo at left. It shows a rectangular building in the classical Georgian tradition: with windows on either side of the entrance in the gabled facade. There were 4 windows on each side of the building. Factoid # 95. The 1861 census showed that Richmond had a population of 516. This was about the same as the population after World War II. This entry was posted in churches, Events, industry, law and order, Personalities. Bookmark the permalink.